So you know we’re really into yarn and knitting and such. And we have spent many an hour in yarn stores, and count friendships forged in our (dearly departed) LYS among our most cherished. Well. 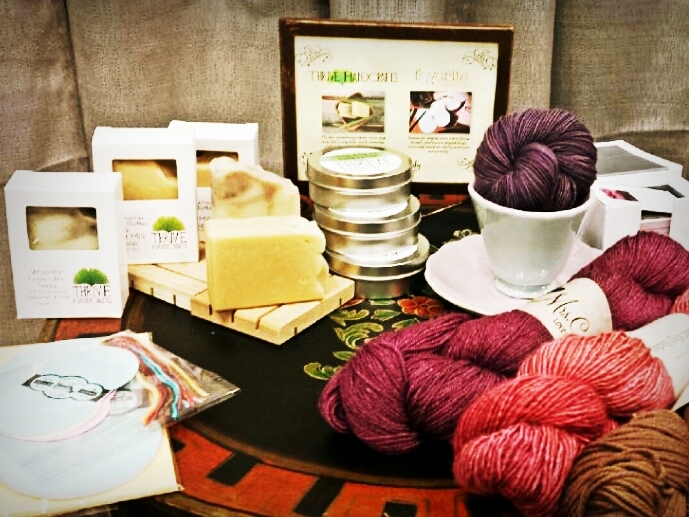 Through one such cherished friendship, we were recently introduced to the owner of a yarn company who was looking for someone to make soap for her shiny new collection of beautiful things. A few emails, soap samples, and crossed fingers later, a new beautiful friendship was formed. Meet Mrs. Crosby! This luscious new yarn brand also includes a collection of Mrs. Crosby’s favorite things… including Thrive Handcrafts soap and lotion bars! This weekend Mrs. Crosby made her debut at The National Needlearts trade show in Indianapolis – and LYS owners from around the country got to fondle Thrive products, including a super-special soap I made with lavender, frankincense, cedarwood, and clove essential oils, all known for their moth-repelling properties. This means Thrive Handcrafts – my sweet baby – will soon be found in yarn stores across America. My face hurts from smiling. This entry was posted in News and tagged Mrs. Crosby, yarn on May 5, 2014 by niemama. Congrats! The soap speaks for itself! Great stuff!